GTHL’s Mississauga Rebels, ALLIANCE’s London Jr. Knights win league titles, Cambridge Hawks officially qualify. Tuesday action includes 4 Wild Card Play-In Games beginning at 2:00 pm, and 4 Round-Robin contests starting at 7:00 pm. Toronto, ON – The weekly rankings are determined by a panel of OHL Central Scouting Staff and represent the top teams that are competing to play in the annual year-end championship tournament which takes place March 14-20, 2017. All games will be played at the Scotiabank Pond in Toronto until the Championship Final moves to the Mattamy Athletic Centre on Monday March 20. Minor Midget playoff action wrapped up over the weekend in both the GTHL and ALLIANCE with the Mississauga Rebels and London Jr. Knights emerging victorious in their respective league finals. The Rebels overtook the Toronto Marlboros 8-6 in points, while the top ranked Knights defeated the Waterloo Wolves 7-1 in points. The Cambridge Hawks also became the final team to secure an OHL Cup berth defeating the Kitchener Jr. Rangers 2 games to 0 qualifying as the ALLIANCE’s third entry. The 2017 OHL Cup powered by Under Armour begins on Tuesday afternoon with four Wild Card Play-In Games followed by four Round-Robin contests. The schedule for the Wild Card Play-In Games has been revised from the original release to accommodate travel in the anticipated inclement weather. The original Wild Card 1 matchup between the Grey Bruce Highlanders and the Toronto Nationals scheduled for 10:00 am will now be played at 3:15 pm, while the Wild Card 2 matchup between the Mississauga Senators and the York Simcoe Express originally scheduled for 12:00 pm will now be played at 5:15 pm. Both games will now be played on Rink 2 at Toronto’s Scotiabank Pond. The four winners of the Wild Card Play-In Games will join 16 other clubs who earned their qualification through league play and regional representation. Last season the York Simcoe Express captured their second OHL Cup title and first since 2004 with a 2-1 overtime win over the Toronto Marlboros. Current North Bay Battalion rookie Rhys Forhan scored both Express goals, while goaltender Andrei Berezinskiy earned tournament MVP honours playing to a 5-0 record with a 2.09 goals-against-average. 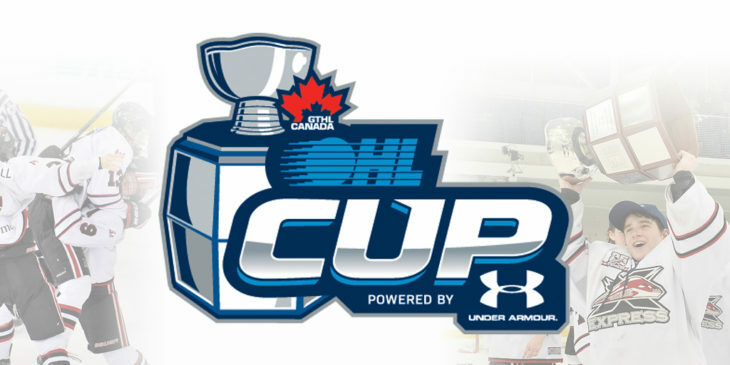 The 2016 OHL Priority Selection featured 12 players chosen in the first round who competed in the OHL Cup including Ryan Merkley (Toronto Jr. Canadiens – 1st overall Guelph Storm), Owen Lalonde (Windsor Jr. Spitfires – 2nd overall Sudbury Wolves), Danil Antropov (Toronto Marlboros – 6th overall Oshawa Generals), Kirill Nizhnikov (Toronto Jr. Canadiens – 7th overall Mississauga Steelheads), Barrett Hayton (Toronto Red Wings – 9th overall Sault Ste. Marie Greyhounds), Peter Stratis (Mississauga Rebels – 11th overall Ottawa 67’s), Akil Thomas (Toronto Marlboros – 12th overall Niagara IceDogs), Adam McMaster (Niagara North – 13th overall North Bay Battalion), Tyler Weiss (Don Mills Flyers – 15th overall Sarnia Sting), Nathan Dunkley (Quinte Red Devils – 17th overall Kingston Frontenacs), Allan McShane (Toronto Marlboros – 19th overall Erie Otters), and Jack McBain (Don Mills Flyers – 20th overall Barrie Colts). Notable OHL Cup graduates currently playing in the NHL include Mitch Marner (Vaughan Kings/Toronto Maple Leafs), Connor McDavid (Toronto Marlboros/Edmonton Oilers), Robby Fabbri (Mississauga Rebels/St. Louis Blues), Max Domi (Don Mills Flyers/Arizona Coyotes), Sean Monahan (Mississauga Rebels/Calgary Flames), Taylor Hall (Greater Kingston Frontenacs/New Jersey Devils), Tyler Seguin (Toronto Nationals/Dallas Stars), John Tavares (Toronto Marlboros/New York Islanders), P.K Subban (Markham Islanders/Nashville Predators), and Steven Stamkos (Markham Waxers/Tampa Bay Lightning). This season the OHL and GTHL announced a new three-year partnership with Under Armour that includes title sponsorship of the OHL Cup Showcase Tournament. The OHL and GTHL have also announced a five-year partnership extension ensuring the event will continue to be hosted by the GTHL through 2021.